The new Google Drive interface has a cool feature: it shows all the files you've uploaded, sorted by file size. Mouse over the storage stats at the bottom of the page ("X GB of Y GB used"), click "Drive" and you'll get to this page that shows the quota used by your files, so you can quickly delete some of the files you no longer need. Interestingly, the URL: https://drive.google.com/#quota also works in the old Google Drive interface. The page doesn't include the documents, spreadsheets, forms, presentations, drawings created with Google Docs, Sheets, Slides, Drawings or converted to the Google formats. The old Google Drive interface also had this feature. You had to click an arrow icon next to "owner", pick "quota used" and sort by quota. 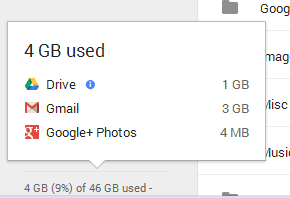 Google Drive only displayed the files from the current folder, so you had to use this URL: https://drive.google.com/#all to see all your files. 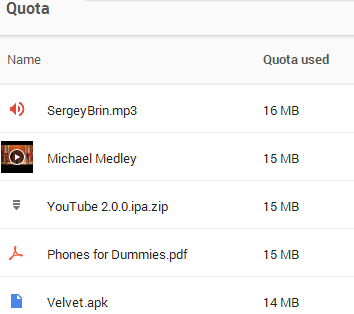 The new quota page is more convenient, but the new Google Drive interface no longer lets you sort folders by quota used.